Un homme au talent unique possédant une voix et un groove hors du commun. Un artiste passionné, traversé dès le plus jeune âge par diverses influences musicales, Jazz, Latin, Blues… Par exemple, Marvin Gaye pour le titre “Why ft. Rachel Claudio, Erik Truffaz & Valérie Delgado”, J Dilla pour la reprise de “Sim- ply Beautiful” d’Al Green ou encore Bobby McFerrin sur le titre “Good Morning”. Tant de chemins croisés pour arriver finalement à un style que Sly nomme HIP-SOUL, contraction de HIP-HOP et SOUL MUSIC. Du HIP-HOP il en a gardé la couleur, la texture, si particulière de ce son, dur, granuleux, sec, franc, lourd et percutant. Il en a évidemment gardé le BEATBOX, cet art vocal où il excelle d’une façon incroyable, notamment sur scène lors de ses improvi- sations fulgurantes lorsqu’il flirte avec La Machine. Le Beatbox qui aujourd’hui est devenu le 1er élément de toutes ses compositions et arrangements. A la Soul Music, il a emprunté la profondeur, la sensibilité, l’émo- tion, la force et l’érotisme, tout ceci délicieusement retranscrit sur ce nouvel album, le tout mariné dans une sauce très funky ! Ce 2ème opus solo enregistré et réalisé à Paris avec la complicité du talentueux et méconnu producteur français Dilouya (Dilouya’s Faithful Circus feat. Omar, Sandra Nkaké, Hugh Coltman, Ndea Da- venport…) et Alex Joduarn (Sweet Basement Studio) est une ode à la musique où s’exprime l’amour de la voix, des sons, du rythme, du Hip-Hop, de la Soul et du Funk. 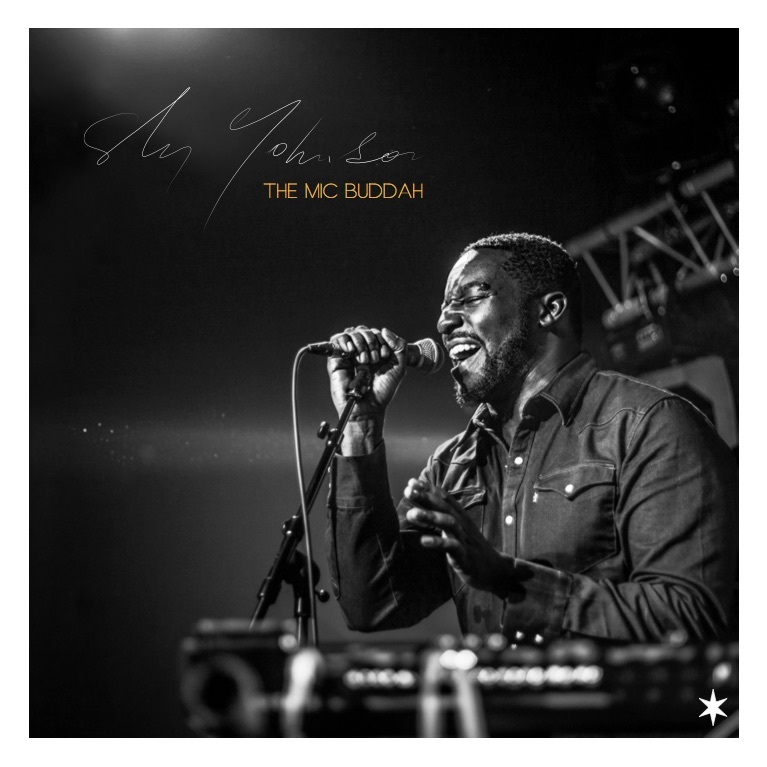 Votre corps vibrera au son de ce nouvel album, THE MIC BUDDAH LP. A singularly talented man with an extraordinary voice and groove, an impassioned artist who has absorbed music influences of the most varied styles since a very young age: from Jazz, to Latin and Blues and beyond. For example, you can hear Marvin Gaye in the track “Why ft. Ra- chel Claudio, Erik Truffaz & Valérie Delgado”, J Dilla in his cover of Al Green’s “Simply Beautiful”, or Bobby McFerrin on the track “Good Morning”. You can hear the results of all these musical convergences and collaborations that have shaped him over the years (SAIAN SUPA CREW… RZA… Camille… Erik Truffaz… Rokia Traoré… Oxmo Puc- cino, whom we find on the track “Music”… Brand Nubian… Roots Manuva… Arsonits… Rahzel… Declaime AKA Dudley Perkins… Wild- child of Lootpack… T3 & Elzhi of Slum Village… Lucky Peterson… Manu Katché… Pino Palladino… Meshell Ndegeocello… Raphaël… Dee Dee Bridgewater… Grace… Jacky Terrasson… Cindy Blackman… TM Stevens… Eric Krasno & Neil Evans of Soulive… D3CCPT… Fred Wesley… China Moses… Oh No… Juliette Gréco… AYO… -M-… Lulu Gainsbourg… Didier Lockwood…Stefano Di Batista… UNION Ana- logtronics… Talib Kweli… Dj Revolution… Sean Price… Roddy Rod… 20syl… The Audience… RUFFPACK… 123MRK… Shash’U, among even many others). So many interwoven paths have led finally to a style that Sly calls HIP-SOUL, a contraction of HIP-HOP and SOUL MUSIC. It retains the unique color and texture of HIP-HOP with its sound that is so tough, grainy, dry, blunt, heavy, and percussive. It has ob- viously preserved its BEATBOX, a vocal art in which he excels tremendously, especially during his dazzling improvisations on stage that you can hear on La Machine. The Beatbox has become the most important component of all his compositions and arrangements. From Soul Music, Sly gets his sense of depth, sensitivity, emotion, forcefulness and eroticism, all of which have been so deliciously mixed together on this new album and spiced in a very hot and funky sauce! This is SLY’s second solo effort. Recorded and produced in Paris in collaboration with the highly talented and still relatively unk- nown French producer Dilouya (Dilouya’s Faithful Circus feat. Omar, Sandra Nkaké, Hugh Coltman, Ndea Davenport…) and Alex Joduarn (Sweet Basement Studio), it expresses SLY’s love of voice, sound, rhythm, Hip-Hop, Soul, and Funk. Your body will shake and groove to the sound of this new album: MIC BUDDAH LP.